As time is of the essence I cheated/took a shortcut and instead of basting my quilt using the special pins which arrived last week, I opted for spraymount instead. 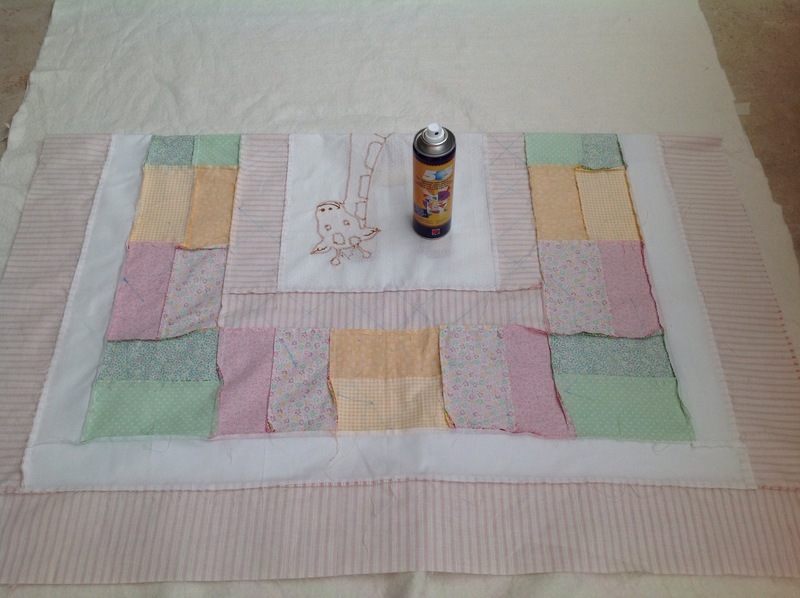 I did as instructed in The Quilter’s Bible and sprayed the wadding in two halves. First to attach it to the backing. 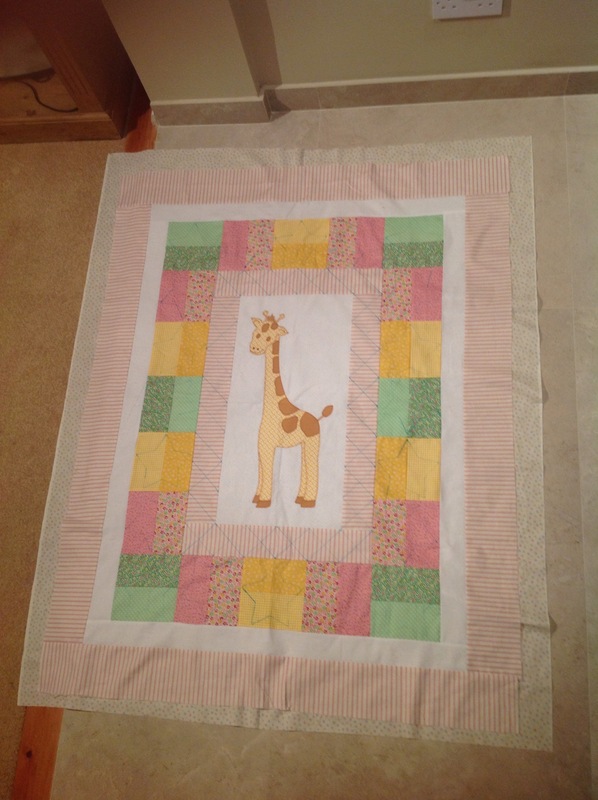 And then the same again to attach the quilt top. Easy peasy, although a bit sticky. 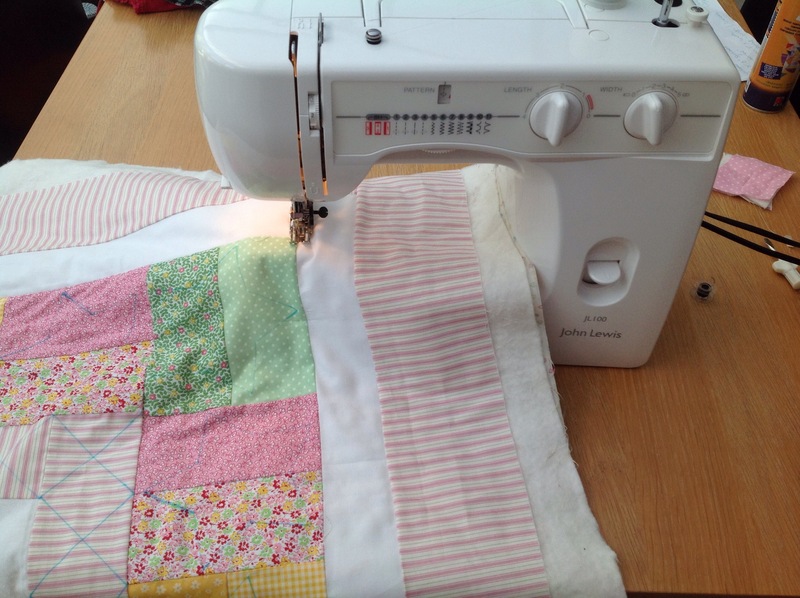 After some deliberation, I decided to start quilting by outlining my squares using the ‘stitch in a ditch’ method. I’m still not sure if that’s what was done on the quilt I’m copying; the instructions don’t say and I change my mind each time I look at the picture of the finished quilt. Anyway, stitch in a ditch. This is where the stitching is supposed to sit in the seam so you can’t see it, but still producing the quilted effect. Hmmm. I think I’ve mostly straddled the ditch, occasionally dipping in to it. Tonight, I’ve quilted the inside border, which I’d marked up with fabric marker, making the lines really easy to follow. Impatient as I am, I wanted to carry on and do all the stars too, but I’m flagging so decided to leave them til tomorrow. Couldn’t resist sneaking one in though. Although it looks like I’m working in the dark, I’m not. Perhaps the lighting in our conservatory isn’t strong enough though. Pretty pleased with how far I’ve got today. 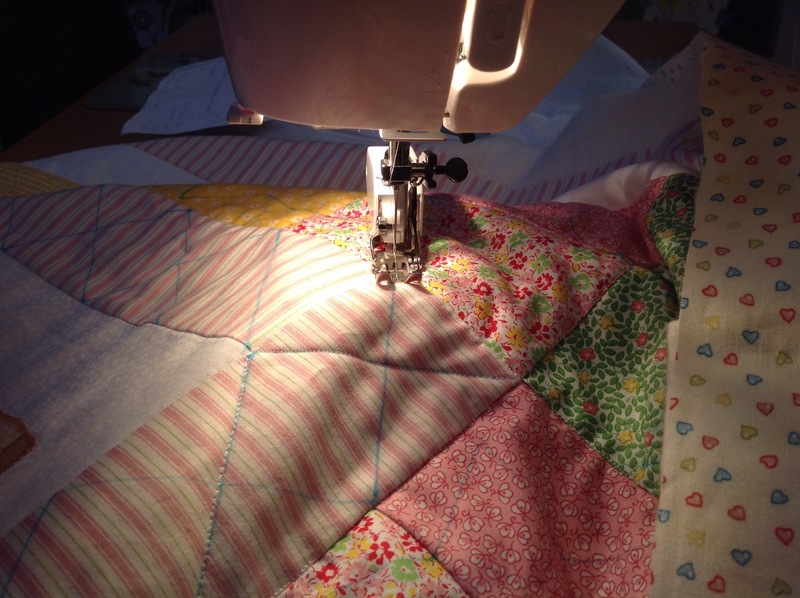 Hoping to finish the quilting tomorrow, then it’s the dreaded binding. I have a horrible feeling I don’t have enough fabric leftover to make my scrappy binding. Then what to do? 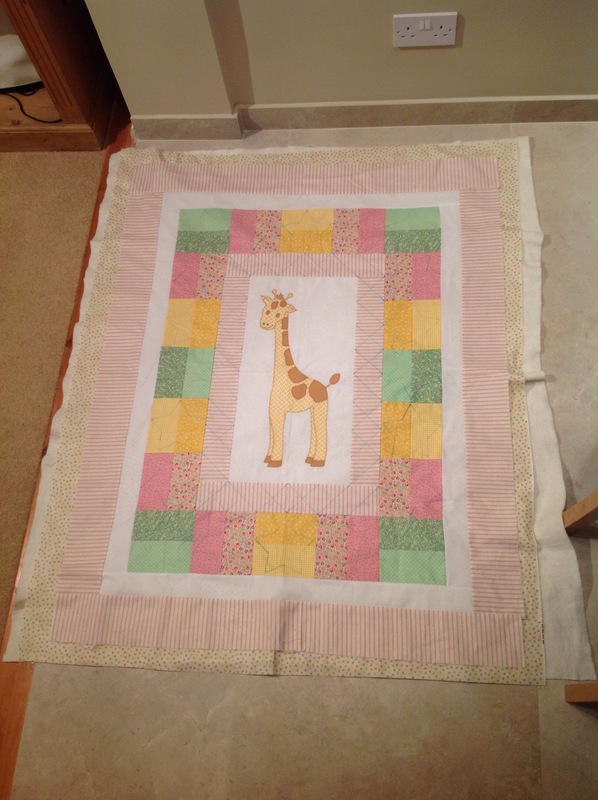 I’m on a big push now to try and get this cot quilt finished by Saturday. Thought if I wrote about it on here, that should motivate me. Tonight, I’ve cut out the wadding and backing. 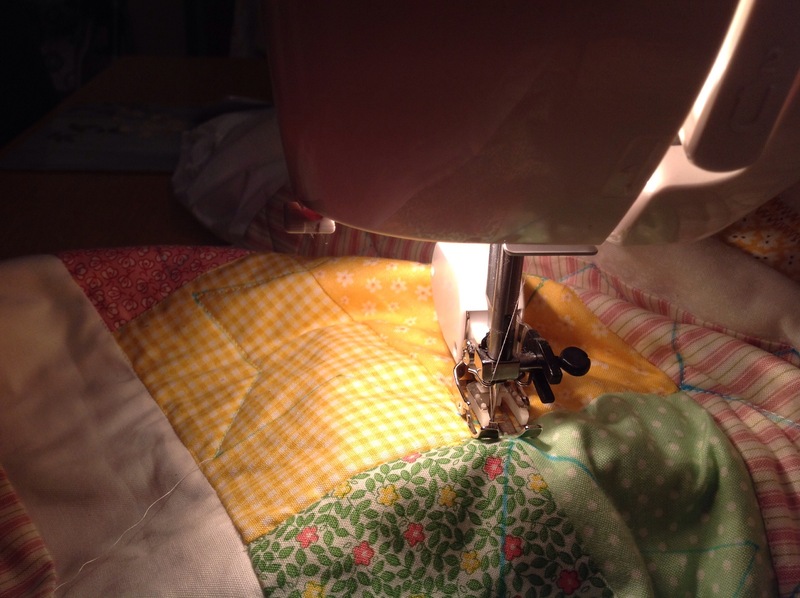 Somehow, I managed to cut the wadding too short in length, but, fortunately, I bought enough for two quilts so I cut another bit to size. The wadding has now ended up larger than the backing. I think I’ve also made a major rookie error. 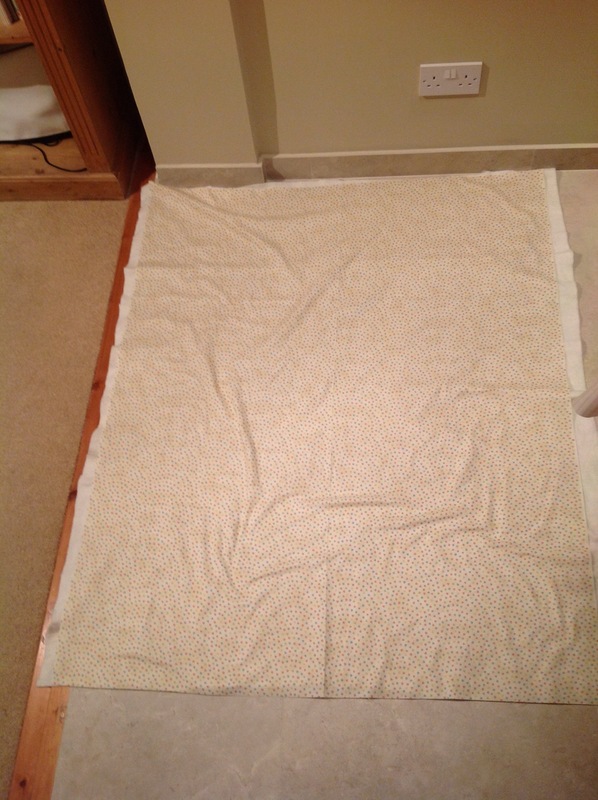 I read that the backing and wadding should be 3-4 inches bigger than the quilt top. So I measured the quilt and added 4 inches on to each measurement. In hindsight, I think that should’ve been 8 inches. Sad face. So not sure I’ll have enough of either now. But I’ll soldier on tomorrow and being the basting. 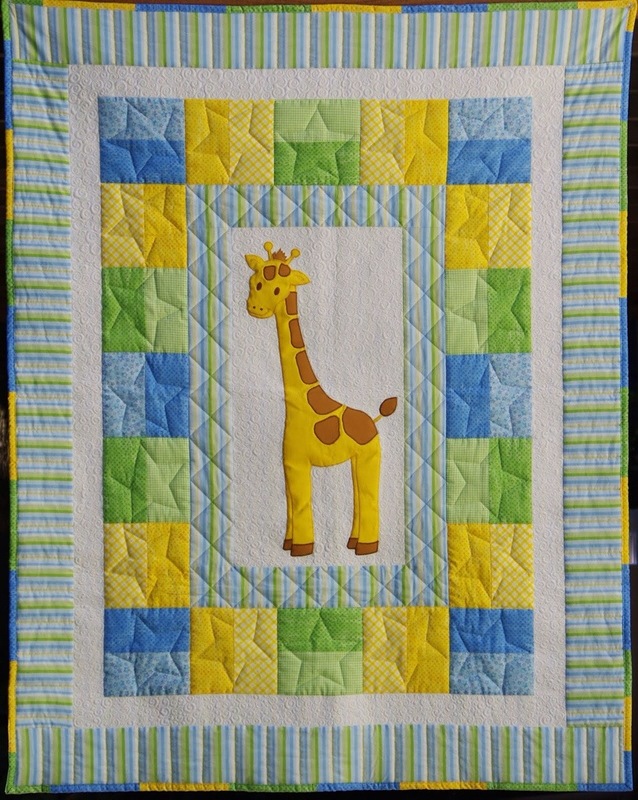 Then quilt and hope for the best! Here’s the backing with quilt top on top. 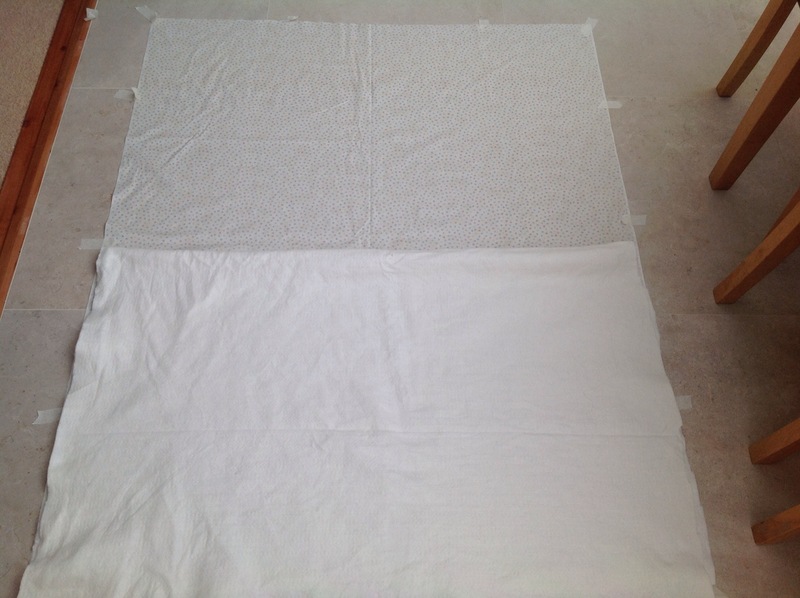 Here’s the backing on the wadding, to show that the wadding is bigger, width wise. I realise that they aren’t in the right order. Hopefully I haven’t made a right hash of it before I’ve even begun. Maybe 9pm isn’t the time to start doing these things. 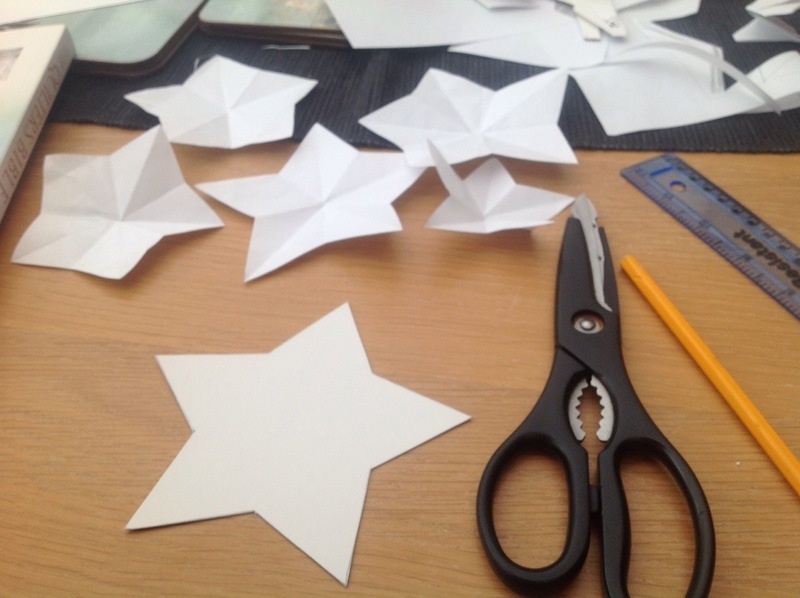 I’ve finally come up with a star shape I’m happy with – it took many attempts. I traced it onto a piece of cardboard to use as my stencil. I’ve now marked on all the stars I need to quilt. I’ve then marked on the crosshatching/diamonds on the inner stripy border. Next up is cutting my backing and wadding to size, then assembling the quilt sandwich. Any tips for doing this? I’ve got some spray mount. What do you use? Am I right? 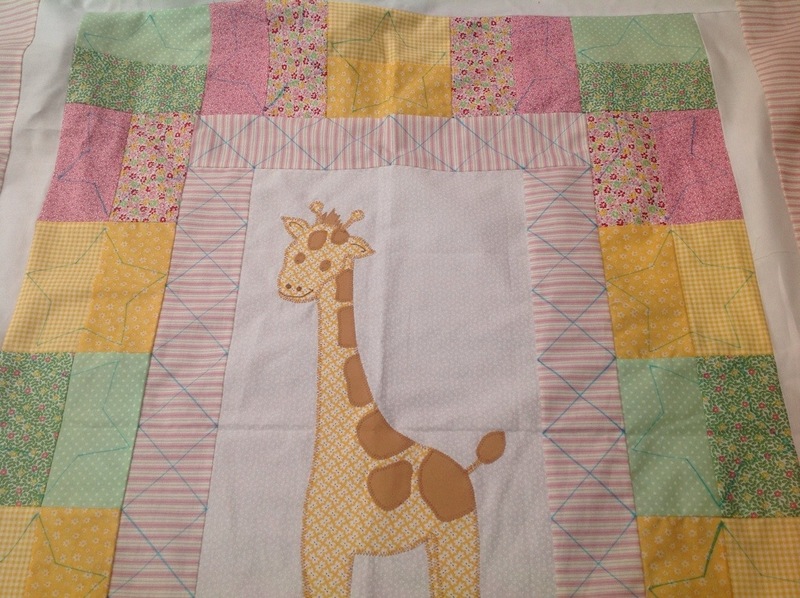 Should I use quilting in the ditch to outline the squares and borders? Rather than just doing the stars and cross hatching? Advice appreciated!